The Massachusetts Division of Fisheries and Wildlife is seeking Proposals to document the habitat characteristics of Large-leaved Goldenrod (Solidago macrophylla), a plant species listed as Special Concern in Massachusetts. This Request for Proposals is intended to improve Natural Heritage’s understanding of the species and the potential threats that it faces. 3) submit a summary of the work to NHESP in the form of a report. NHESP through a partnership with BNRC has allocated up to $5,000 for developing and initiating a long-term monitoring protocol of the species and its habitat, with a particular focus on how climate change might impact the species. 1. Develop a long-term monitoring protocol for the population of Solidago macrophylla in Massachusetts that will detect changes in the health of the plants and their community over time. 2. Conduct this vegetation and community monitoring in 2019. 3. Select a variety of elevations and aspects to observe. 4. Describe the primary communities which currently support Solidago macrophylla and conditions where it is found. 5. Document and report all MESA-listed and SWAP-listed species encountered during this study. 6. Summarize findings and present them to NHESP in a report by December 16, 2019. The awarded researcher will develop a monitoring protocol to detect changes over time in the population of Solidago macrophylla in Massachusetts. It must include the population on Mount Greylock State Reservation and may include additional populations at Savoy Mountain State Forest, Savoy Mountain Conservation Area and the Hoosac Range. This monitoring protocol will be used in future years by NHESP biologists and their associates to detect and track changes in the population of the species. This monitoring protocol must be powerful enough that qualified staff will be able to regularly conduct monitoring (every three to five years), yet simple enough that qualified staff can conduct sampling efficiently and within a reasonable amount of time. The monitoring protocol will be developed with the input, and ultimate approval, of NHESP staff, and the awarded researcher will conduct the initial data collection during 2019. The awarded researcher will also describe the vegetative communities (list approximately 10 associated species) where these rare plants are observed, document potential threats to the species, and document all species (plants and animals) of conservation concern encountered during this work (submitting reports to NHESP through the VPRS reporting system); and then submit a summary of all work to NHESP in the form of a report. • Develop a monitoring protocol and plan for implementation to detect important changes in the population(s) of Solidago macrophylla in Massachusetts. This Plan will be designed to be powerful enough to detect important changes in vegetation composition and structure over time, but of a complexity that will allow NHESP staff to continue monitoring into future years with reasonable effort and without burdensome time commitment. The Plan will be developed by the awarded researcher, with input from NHESP staff. The awarded researcher will present the Monitoring Plan design to NHESP for approval. The approved Plan must be finalized before May 31, 2019. The approved Plan must be repeatable, based upon standardized and comparable sampling techniques. Once the Plan is approved, the awarded researcher will conduct the initial monitoring during the 2019 season. 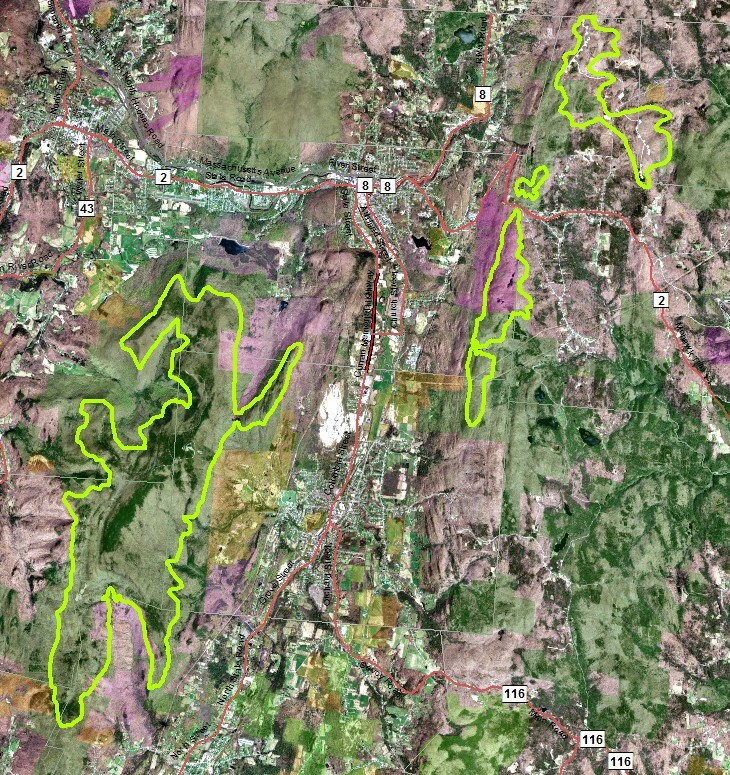 • Obtain permission from Department of Conservation and Recreation (DCR) to conduct research in Mount Greylock State Reservation (NHESP staff will assist with this step once the monitoring protocol is sufficiently designed to be submitted to DCR; https://www.mass.gov/how-to/apply-for-a-research-permit). Note that the roadways on Mount Greylock are open for only the summer months. • Map and describe Solidago macrophylla at different elevations and aspect. NHESP can loan 10 HOBO data loggers for periodic temperature and light measurements. Determine where these would be best placed to collect data on potential climate change and how frequently data should be logged. We assume more than one year of data will be needed, though this might not be in consecutive years. • All MESA-listed and SWAP-listed species encountered during these studies, in addition to, and including populations of Solidago macrophylla, need to be documented and entered into the Natural Heritage VPRS data reporting system. Documentation will include information on species composition, abundance or density of plants, habitat and associated species, and GPS coordinates of all observations. Do populations at different elevations experience a different range of temperatures? Is either a high or low temperature related to the health of Solidago macrophylla populations? Does aspect (either North-South and/or East-West) affect habitat suitability for Solidago macrophylla? Is increasing temperature, changes in humidity and soil moisture, or increasing light related to the vigor (number of ramets, height of plants) or presence of flowering or percent of viable seed? Do soils vary between the populations selected for monitoring? Is this in relation to elevation within populations of Solidago macrophylla? Is deer or rabbit browse or insects impacting the populations of these rare plants; does this vary by elevation? Are selected populations of this species producing viable seed? What pollinates Solidago macrophylla? Is it the same suite of species at the higher elevations as at its lower elevations? Are invasive species threatening these plants in any study locations? What is the optimal basal area/age/composition of forest species for vigorous growth and flowering in S. macrophylla? • Meeting or telecommunication conference with NHESP to discuss monitoring protocol and potential problems. • A Long-term Monitoring Protocol and Implementation Plan for Solidago macrophylla in Massachusetts submitted and approved by NHESP before May 31, 2019. Maps and GPS locations of plots and transects. Records of all MESA and SWAP-listed species entered into the VPRS rare species recording system. 6. Curriculum vitae or equivalent statement establishing the applicant’s background and qualifications relative to the proposed project. For collaborative efforts, please include names, contact information and synopses of qualifications for all who will contribute to the project. For students, please also include information on primary professor that you will be working with. All responses must include all of the documents listed above. BE SURE TO INCLUDE ALL THE ITEMS LISTED OR YOUR RESPONSE WILL BE FOUND TO BE INCOMPLETE AND NON-RESPONSIVE.